energy released in the shaking, 6.7 for the Northridge earthquake), however this does not provide any details for how the intensity of shaking is stronger in some places than others. This is the purpose of a ShakeMap, which quickly plots data from seismometers to show which areas shook more strongly than others. ShakeMaps today are created within a few minutes using digital data. A similar map in 1994 took more than a month to create! The map below is a ShakeMap depicting how the Northridge earthquake shook southern California. The small square represents the 10×10 mile portion of the dipping fault that ruptured beneath the San Fernando Valley- deepest at the south, and closer to the surface at the north. Notice how the strongest shaking was to the north of the epicenter, in the direction the fault ruptured. Read more below the map to learn why the shaking that people experience in the same earthquake can be so different. 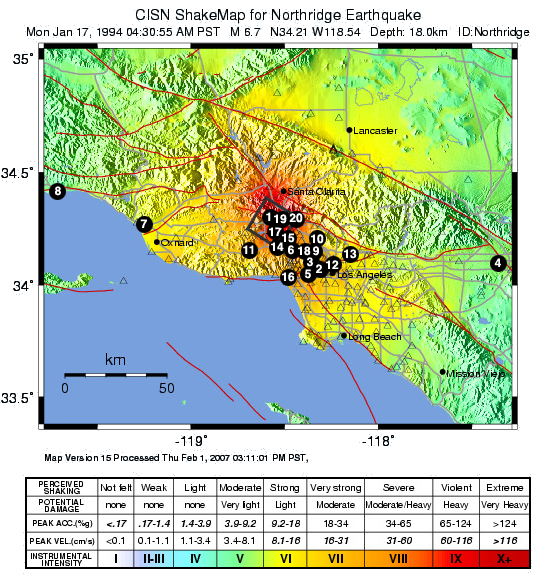 We have asked many people who experienced the Northridge earthquake about their “Groundshaking Story.” Click the numbers on the map to view a short video of their story. If you would like to share your story (even if no damage occurred where you were located), please contact us and be sure to provide details about your experience. Interviews with people who experienced the earthquake in different locations and situations can be viewed by clicking each number. How close they were to the rupturing fault: For small earthquakes this is the distance to the epicenter, the point on the Earth’s surface above where the earthquake begins. For larger earthquakes faults can rupture for many miles, such that you may be closer to where the fault stops rupturing then to where it began. The “blind thrust” fault that ruptured in the Northridge earthquake is at an angle in the ground, coming closer to the surface beneath Granada Hills than Northridge, so people in the northernmost San Fernando Valley were actually closer to the fault than people in Northridge. Their location relative to the direction the fault ruptured: As the map shows, shaking was stronger to the north of the epicenter, as the fault ruptured from near it’s bottom in the south upwards to the north. If the rupture direction had been towards the south where many more people live, losses would have been much greater. The type of soil or subsurface structure beneath them: Sediment-filled valleys and “soft” soils amplify shaking which can add complexity to the pattern of shaking. Some locations far from the Northridge epicenter experienced more intense shaking than closer locations, because of this amplification effect. The type of building they were in: Older buildings built before modern building codes or with structural issues may not have withstood the strong shaking. Taller buildings may have kept swaying long after the ground shaking stopped.